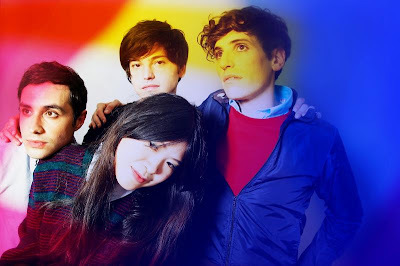 The Pains of Being Pure At Heart "Say No To Love" from Slumberland Records on Vimeo. The Pains of Being Pure at Heart released its self-titled debut album way back at the beginning of 2009. Since then the band has kept its fans satisfied while expanding their pop palette on the excellent Higher Than the Stars EP and this Summer's shimmering anthem "Say No To Love”. We're extremely pleased to report that the band has been recording, mixing, and mastering their much-anticipated sophomore full-length which is slated for a March 2011 release on Slumberland. In November the band will release the first single titled "Heart in Your Heartbreak" from the album with an exclusive B-side. The band launches a limited US tour on Oct. 20 in Boston (including CMJ in New York this week) and will be trying out a few songs from the new record live on these dates. Stay tuned for more preview updates on this incredible new song as the album's first offering. A rousing step forward that manages to retain the ebullient charm, wit and pop panache of their best work, we're kinda crazy excited for you to hear what's next. Nov 6 - Holocene Portland, OR + !